I am fascinated by the ordinary, quiet moments that occur in our everyday lives. 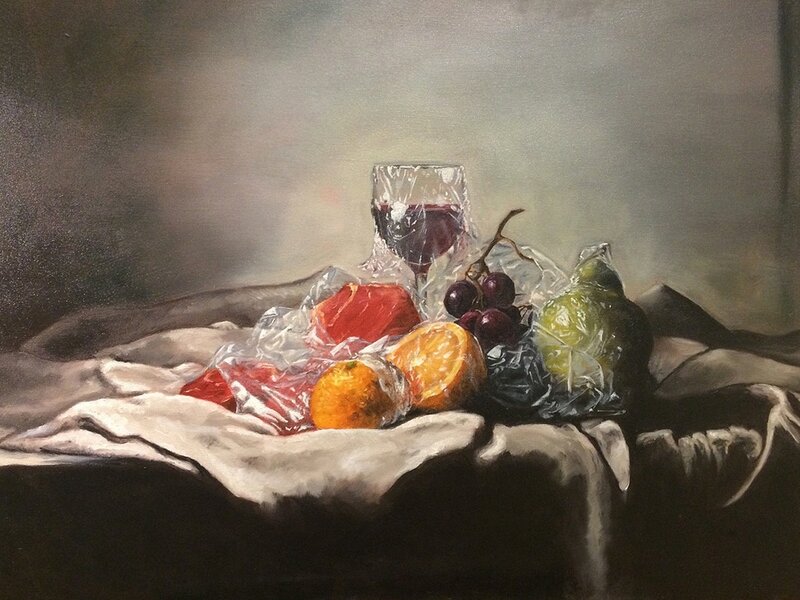 My still life paintings focus on exploring material culture within the home. My work delves into the small, intimate moments that happen within our homes and the way the objects we place around us shape and construct our lives. I approach still life painting in a contemporary context, working with material and textiles of our daily lives. Through the lens of rhopography, which is the depiction of things that lack importance, I bring attention to the trivial items that are presented in the artwork. I depict everyday objects and materials that are often overlooked. Through meticulous rendering, I aim to bring newfound importance to every crease, wrinkle, or shadow of the object. The human figure is absent in these works, emptying the painting of any distinct narrative or drama. By examining the stillness of the routine, and the intimate, I strive to emphasize the absence of the human body, choosing to depict materials that have been, touched by human activity. In a pile of folded laundry, wrapped food, or an unmade bed, marks human absence. ​Gwendolyn Brown is an artist born and raised Ellicottville, NY. She currently lives and works in Ellicottville, NY and Toronto, ON. She is currently completing her BFA at the Ontario College of Art and Design University in Toronto, majoring in Criticism and Curatorial Practice with a minor in Drawing and Painting. Brown has exhibited her paintings in various cities in the US and Canada, as well as internationally in Italy. She has also curated exhibitions in the US, Canada and Italy.